Frodo Baggins knew the Ringwraiths were searching for him?and the Ring of Power he bore that would enable Sauran to destroy all that was good in Middle-earth. Now it was up to Frodo and his faithful servant Sam to carry the Ring to where it could be detroyed?in the very center of Sauron's dark kingdom. Frodo and his Companions of the Ring have been beset by danger during their quest to prevent the Ruling Ring from falling into the hands of the Dark Lord by destroying it in the Cracks of Doom. They have lost the wizard, Gandalf, in a battle in the Mines of Moria. And Boromir, seduced by the power of the Ring, tried to seize it by force. While Frodo and Sam made their escape, the rest of the company was attacked by Orcs. Now they continue the journey alone down the great River Anduin -- alone, that is, save for the mysterious creeping figure that follows wherever they go. The second volume in J.R.R. 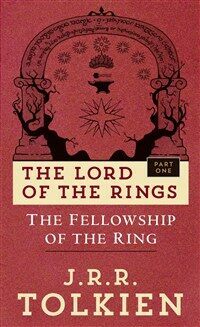 Tolkien's epic adventure, THE LORD OF THE RINGS. While the evil might of the Dark Lord Sauron swarmed out to conquer all Middle-earth, Frodo and Sam struggled deep into Mordor, seat of Sauron's power. To defeat the Dark Lord, the accursed Ring of Power had to be destroyed in the fires of Mount Doom. But the way was impossibly hard, and Frodo was weakening. Weighed down by the compulsion of the Ring he began finally to despair. The awesome conclusion of J.R.R. Tolkien's The Lord of the Rings, beloved by millions of readers around the world.